Hi everyone! I hope you had a lovely weekend-the weather has been rather hit and miss where I live but yesterday when I took a walk into town, it was brisk and sunny and a welcome spot of exercise after overindulging in ciders and curry on Saturday night!! I am not really much of a jewellery wearer- I do have a selection of real and costume jewellery of course but I tend to wear just earrings on a regular basis with rings and necklaces being worn occasionally. It seems that the 'statement necklace' is very much evident this season and visiting different blogs and reading the magazines it seems that a lot of designers and the high street have a lot to offer that are being snapped up by many to style up winter sweaters and chunky knits. I've been keeping my eyes open for the right one for me and on Friday I finally managed to track down the one I wanted and bearing in mind I know I won't wear it regularly it was great to get one for less than a fiver! 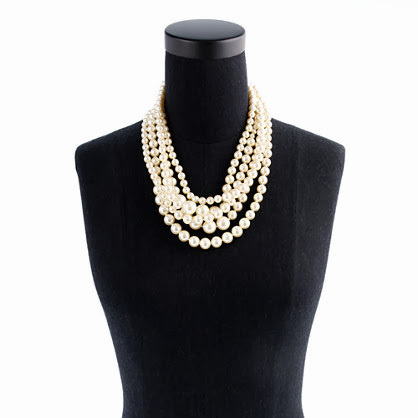 This J Crew necklace is a great choice for those who have the funds to indulge in a chunky pearl necklace that is timeless and elegant in style and with the new J Crew now open in London there is sure to be a lot of stylistas eager to grab their statement necklace for under £100 for the coming festive season and beyond! This is a really trendy, stylish choice for anyone who wants to mix pearls and stones and a real bargain price which will not only look great in the daytime over a grey sweater or chunky knit but just as gorgeous for a night out over a LBD or a black sweater and leather skirt or pants combination! There is no link to this one as it was bought in store and I'm pretty sure it is new in as I hadn't clocked it when I was in Primark a couple of weeks ago. The picture doesn't really show how lovely it is- a good weighty piece for the money and the chain and pearls do not look cheap either, which has been a main sticking point for me when choosing my ideal piece of costume jewellery. A lot of necklaces on the high street look really pretty, but close up the stones look quite cheap looking even when the necklace isn't. I am linking this post to the lovely Claire Justine for Creative Mondays, if you get a chance to check out her blog with links to a lot of other stylish and creative bloggers. Have you indulged in a statement necklace this season or do you already have one (or more) in your jewellery box already? Maybe you've a special one on your Christmas list, do share!! Wishing you all a really great week ahead! I 've always been a fan of pearls and the chunky J Crew ones are gorgeous but you have discovered some lovely alternatives too. Great for the Christmas season ahead too. What a coincidence! I am so into pearls lately.. I have to say they tend to be a bit dressy but hey, for that night out why not, right? I am sooooooooooo glad to see your comment and lovely finds, dear Sharon. Oh yes, I love that necklace, too. You are great at getting a deal! I've got a Giveaway going at my blog for ONLY my followers. enter. ooh , I might have to have a trip to Primark. I've started wearing my chunkier jewellery but the new pieces you've selected means I want to go out and buy more! I've seen some lovely ones in Matalan too. i love it. i don't have anything like this...i might need to look around!